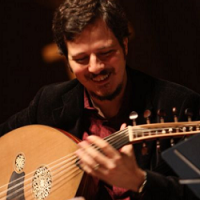 Tune in at midnight this Thursday to hear an interview with composer/multi-instrumentalist Mehmet Ali Sanlıkol. Just out with his big band album "What's Next? ", Mehmet Ali Sanlikol spanned multiple genres in his carreer including jazz, funk, Turkish folk, classical and devotional music. His new album brings it all together with a fresh and organic sound. Tune in to hear his music, and more. Read more for his bio. Mehmet Ali Sanlıkol studied western classical piano with his mother Fethiye Sanlıkol and started giving piano recitals as early as age five. Until the year 1992, he constantly performed classical and contemporary music. Later on he studied with the internationally acclaimed Turkish composer/Jazz pianist Aydın Esen and won a scholarship to Berklee College of Music. In 1997, he found the electric jazz band AudioFact with Onur Türkmen and toured Mexico, Argentina, the USA and Europe. In that same year he received Berklee College of Music’s Clare Fischer Award and completed his degree in Jazz Composition and Film Scoring. In the year 2004 Sanlıkol completed his Doctor of Musical Arts Degree in Composition at the New England Conservatory and helped find the organization Dünya based in Boston, Massachusetts. Sanlıkol is the president of Dünya, a musicians’ collective which explores a cosmopolitan view of the world through the lens of a wide range of Turkish traditions, alone and in conversation with the musics of the formerly Ottoman peoples—Greeks, Jews, Armenians, Arabs, Kurds, mystics—as well as with western and other world traditions. Dr. Sanlıkol taught at Berklee College of Music and New England Conservatory. He is currently a faculty member at College of the Holy Cross and Emerson College, and a research fellow at Harvard University. Bio modified from his website.